Haley Kinsel of Cotulla, Texas, officially accepted her gold buckle as the 2018 WPRA World Champion one night after clinching the title, and Carman Pozzobon, of Aldergrove, British Columbia, made another clean run in the 10th round to claim the Wrangler National Finals Rodeo average crown at the Thomas & Mack Center. Kinsel, the 24-year old was last year’s WPRA reserve world champion and won four rounds and placed in two others earning $157,865 in the process. She rode her outstanding 7-year-old palomino mare, DM Sissy Hayday “Sister,” in the first nine rounds and enjoyed a solid Round 10 aboard 14-year-old gelding, Thunder Stones “TJ,” prior to picking up her gold buckle. Pozzobon, did not perform like a NFR rookie while riding her 8-year-old buckskin mare, Ripn Lady “Ripp,” during all 10 rounds. She and Ripp were the only duo to finish 10 rounds without a downed barrel and won the $67,269 average check with a total time of 139.46 seconds. Her consistency moved her from 15th to fourth in the world with a total of $204,831. MULVANE, Kan. – With an opportunity to win his fourth gold buckle, Scott Snedecor delivered in dramatic fashion Saturday night. The Fredericksburg, Texas, cowboy won his second-consecutive gold buckle by winning Round 10 with a blistering, 9.0-second time at the 2018 Clem McSpadden National Finals Steer Roping at the Kansas Star Arena. Snedecor, who also won world titles in 2005, 2008 and 2017, finished with $121,930 in the PRCA | RAM World Standings to edge regular-season leader Tuf Cooper, who placed second with $112,157. Snedecor and his wife, Kelli, have two children, son, Colton and daughter, Kallyn. When Snedecor backed into the box for Round 10 – factoring in that he was fifth in the average – he trailed Cooper by $4,096. To clinch the title, Snedecor, who as the 14th roper in Round 10 went right before Cooper, had to win the round, which paid $9,155 and earn a check in the average race. If Snedecor did that, Cooper wouldn’t be able to catch him. And that’s exactly how things unfolded. In addition to winning the 10th round, Snedecor also took home $13,202 for finishing fourth in the average. Snedecor joins Rocky Patterson with four gold buckles. Only legendary Guy Allen (18), Everett Shaw (6) and Trevor Brazile (6) have more steer roping gold buckles than Snedecor and Patterson. Snedecor won Round 2 and Round 10 outright and split the win in Round 1. He also was second in Round 4, while he split fourth in Round 6. He earned $51,086 at the NFSR, the most of any cowboy. The home of the Dallas Cowboys became home to the world’s best cowboys and cowgirls Sunday, Feb. 25, as turf turned into dirt for the world’s richest one-day rodeo. RFD-TVs The American presented by DISH is changing lives with an incredible payout for the winning athletes. The $1 Million side pot reserved for qualifiers winning their events, was divided in thirds with Matt Reeves, who won the Steer Wrestling, claiming his share. Reeves, along with Tyler Pearson were among the four cowboys to qualify for the final round. Stopping the clock in a smoking 3.73, Reeves was crowned the Champion, earning $433,333 for his efforts. Pearson was close behind with a time of 3.79 and took home a check for $25,000. The Calf Roping event proved to be a thriller as Cory Solomon earned runner-up honors with an impressive time of 6.45. Also earning the $25,000 runner-up check was Hailey Kinsel in the Barrel Racing. Last year’s Champion, Kinsel clocked a 14.982, finishing just one tenth behind the winner. After setting a record in the qualifying round, Kaleb Driggers and Junior Noguiera went on the claim their $100,000 checks by winning the Team Roping. The winners circle at the American is a familiar place for this pair as they were crowned champions, stopping the clock in 4.57 in the final round. When the dust settled at the AT&T center, Hailey Kinsel and Dakota Eldridge were at the top. In the Barrel Racing, Kinsel set a new San Antonio Rodeo record during the semifinals on her great seven-year-old mare, DM Sissy Hayday. They stopped the clock in 13.60 seconds. She ran the second fastest time of the day in the Championship Finals, with a 13.85 securing the championship which earned her $25,141. In the Steer Wrestling, Nevada native Dakota Eldridge turned in a 3.6 which was the best of the day. He took home $23,081 from the prestigious San Antonio Rodeo. Tyler Pearson rode away from his 2017 season with the Horse of the Year and the World Championship honors in the Steer Wrestling. The 32-year-old Pearson hadn’t qualified for NFR since 2013 before narrowly taking his first steer wrestling world title. The Mississippi cowboy won eight events leading up NFR before finishing second in the average to just slip past Ty Erickson for the gold buckle. Much of Tyler’s success this year is due to a partnership with Kyle Irwin who also qualified for the NFR. The Southeastern Circuit cowboys have been traveling together, hazing for each other and most importantly are partners on a horse. That horse, Canted Plan, that they all call Scooter was selected as the AQHA/PRCA steer wrestling horse of the year. Both Tyler ad Kyle have earned a lot of money on the 12-year-old sorrel gelding this year. 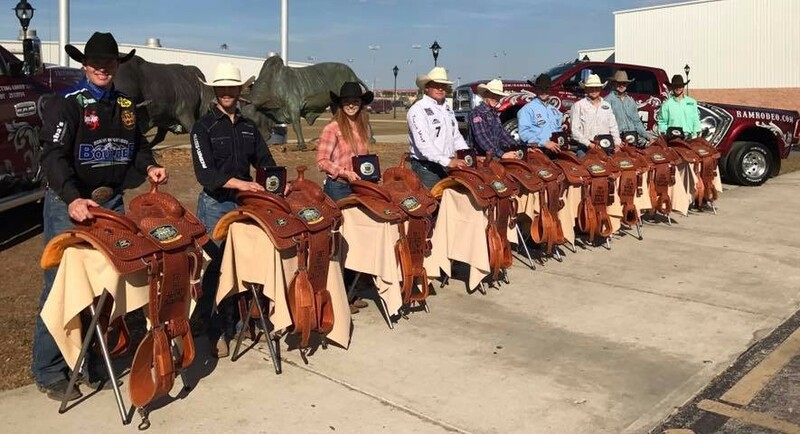 The 2017 speed-event horses of the year were chosen by the top 25 rodeo contestants in barrel racing, tie-down roping, steer roping, heading, heeling, and steer wrestling. The steer wrestling Horse of the Year is Canted Plan (“Scooter”), who is by Up Your Face and out of Gambler Speed by Crystal Gambler. Scooter is owned by Tyler Pearson and Kyle Irwin. Pearson enters his second NFR third in the world standings, and Irwin is 11th. Shane Hanchey’s Simon Cow (“Si”) claimed top tie-down-roping horse honors. By Dual Pep and out of Bingo Legacy by Bingo Hickory, Si has been Hanchey’s partner since May 2015, and he helped Hanchey finish third in the regular season would standings and qualify for his eighth career NFR. The steer roping horse that took the top spot was John Bland’s Carols Sassy Doc (“Salty”), by Poco Sassy Doc and out of RSI Carol by Peppy Taito. The sorrel gelding helped Bland have the best season of his career and powered him to his first qualification to the Clem McSpadden National Finals Steer Roping, which is November 10-11 in Muvane, Kansas. Salty is 16 years old, and Bland has owned him his entire life. Congratulations to all of our clients that qualified for the 2017 National Finals Rodeo! They will be competing in Las Vegas at the Thomas & Mack Center December 7-16. The 2017 RAM National Circuit Finals Rodeo (RNCFR) took place in Kissimmee, FL with 24 contestants in each event. They competed twice in hopes of being among the eight that advanced to Sunday’s semifinals. Then the top four from the semifinals competed in one final round that determined the champions. For the third year in a row Josh Peek took home the All-Around Cowboy title. Competing in both the Tie-Down Roping and Steer Wrestling, Peek, a Mountain States Circuit cowboy took $5,117 home to Pueblo, CO. Topping the Tie-Down Roping from the Wilderness Circuit was veteran roper Matt Shiozawa from Chubbock, Idaho who was stopped the clock in 7.3 seconds in the final round. Riding his bay mare Alotta, Shiozawa won his fourth RNCFR championship pocketing $15,541. Reserve Champion honors went to Turquoise Circuit athlete Joseph Parsons. The Marana, AZ cowboy was an 8.1 in the final round. Rounding out the top 3 in the Tie-Down Roping was Randall Carlisle representing the Southeastern Circuit, who made a solid 8.4 second run on the final day of the rodeo. JD Struxness rode away with the Reserve Champion title in the Steer-Wrestling. He finished the final round with a 4.0, earning him $5,686 for the run. Struxness represented the Prairie Circuit at the RNCFR. The 2017 Barrel Racing Champion Emily Miller of Weatherford, OK teamed up with her great horse Pipewrench to earn $13,646 in Florida. The Prairie Circuit duo ran one of the fastest times of the rodeo in the final round, clocking 15.27.